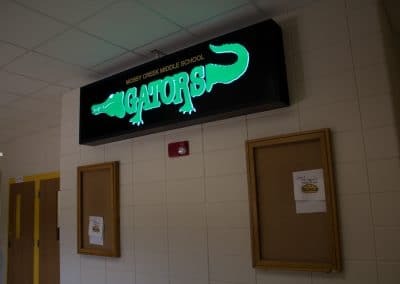 Deep in the back woods of Houston County, the “Creek” comes alive with the spirit of the Mossy Creek Middle School Gators. 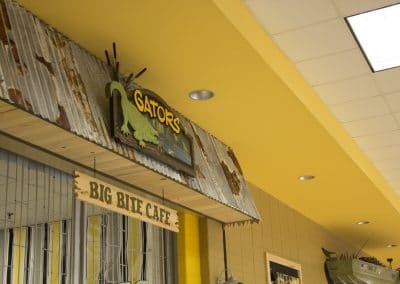 In search of the perfect meal the gators meander to The Gators’ Big Bite Cafe. 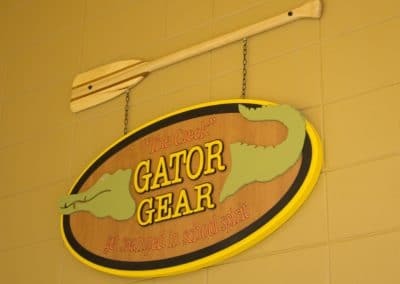 Here their surroundings are all but stagnant moving with colors of warm yellows and golds like the rustle of the leaves and cool blues and greens like the ripple of the water. 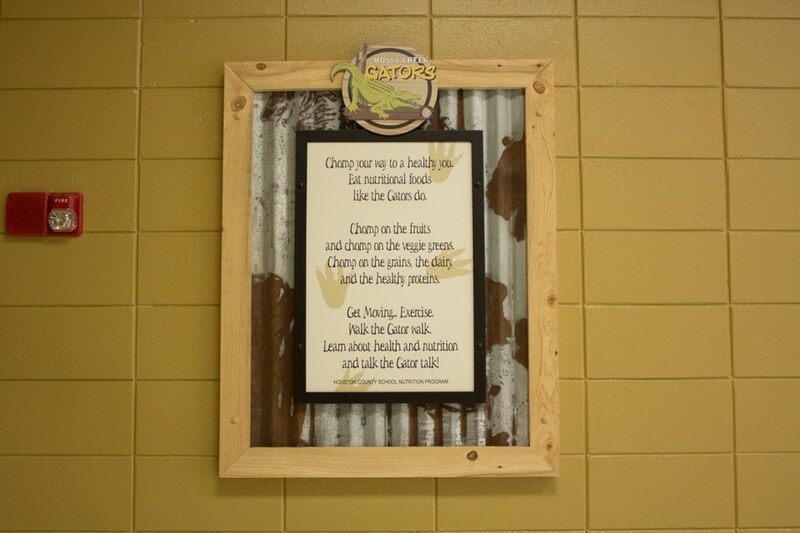 The gators appetite is heightened with rich colorful nutritional images filled with rustic textures promoting nutrition education. 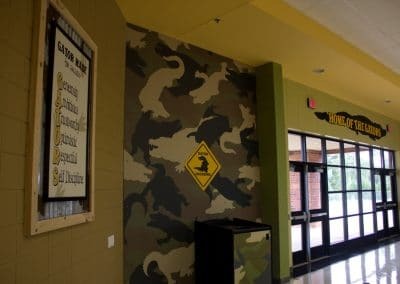 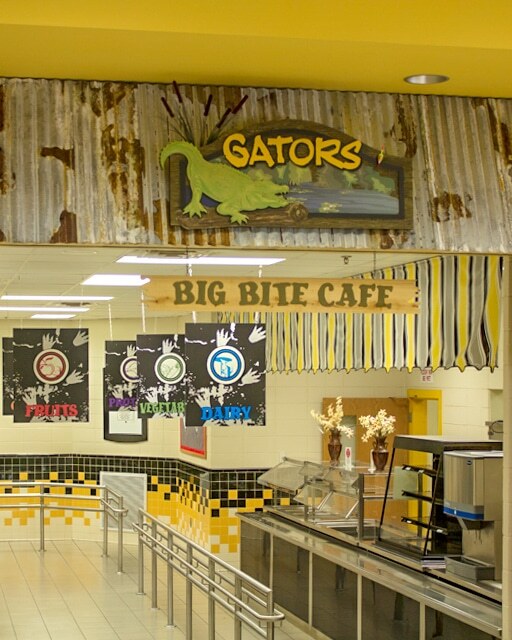 The Gators’ Big Bite Cafe boasts the schools spirit with entwined gator patterns in moss inspired greens certain to camouflage any Mossy Creek Gator. 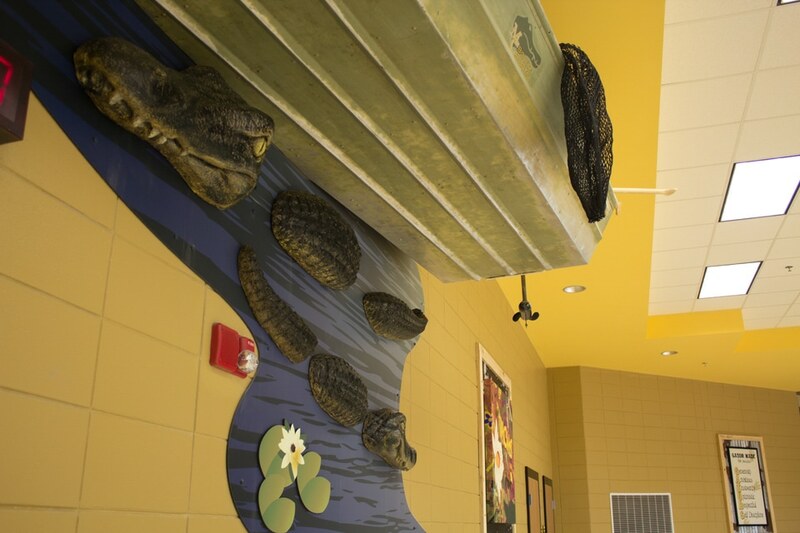 Woodsy rural designs reflect on the gators survival traits as the gators ancestors predated the dinosaurs. This perseverance, persistence, and strength of character is instilled and reiterated in the Mossy Creeks’ young gators. 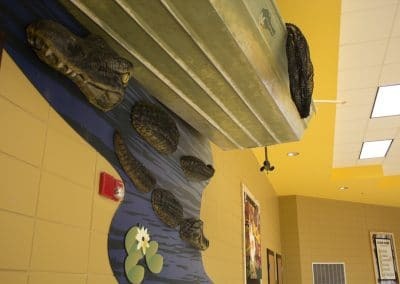 But this gator gathering would not be complete without its 12 foot alligator and baby lurking towards a trolling jon boat, a true showcase sure to warrant a roll over. 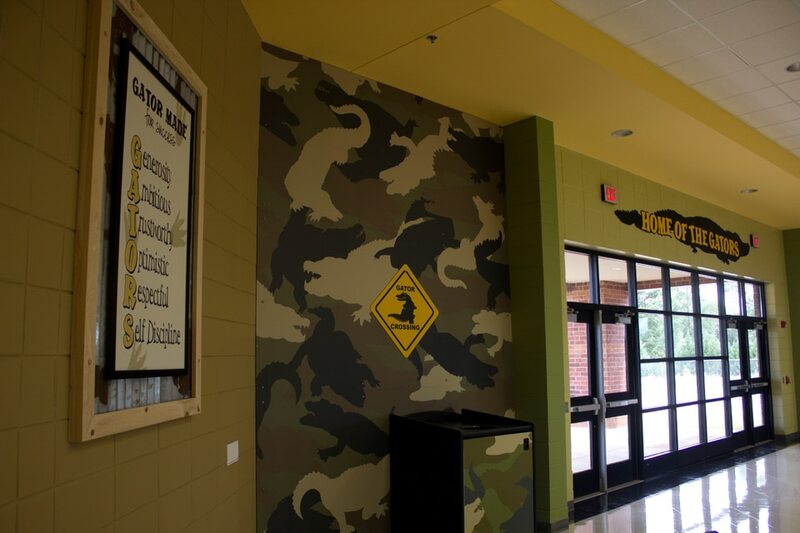 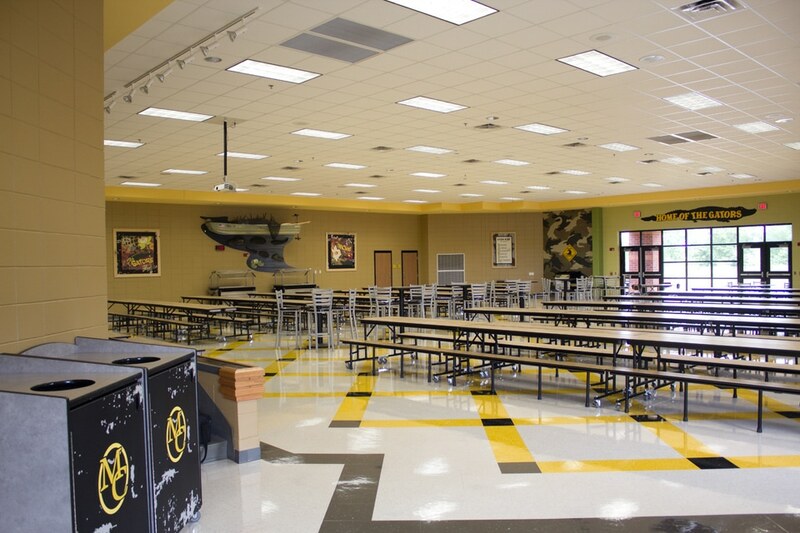 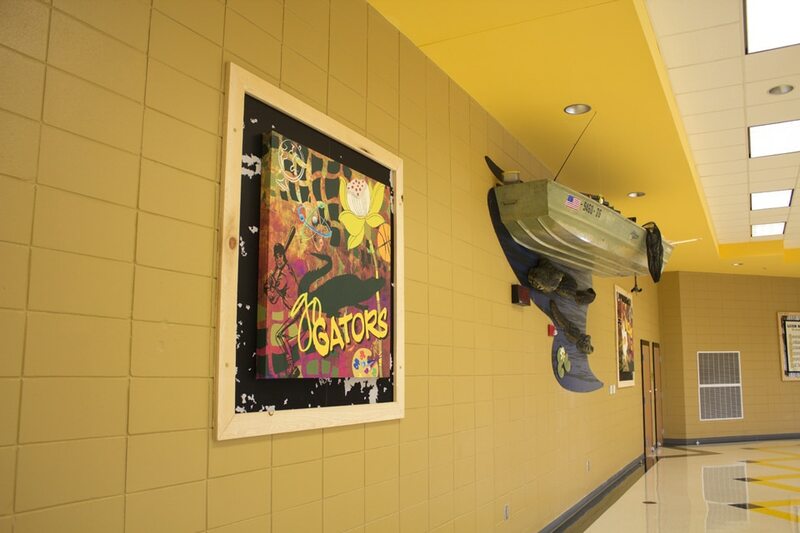 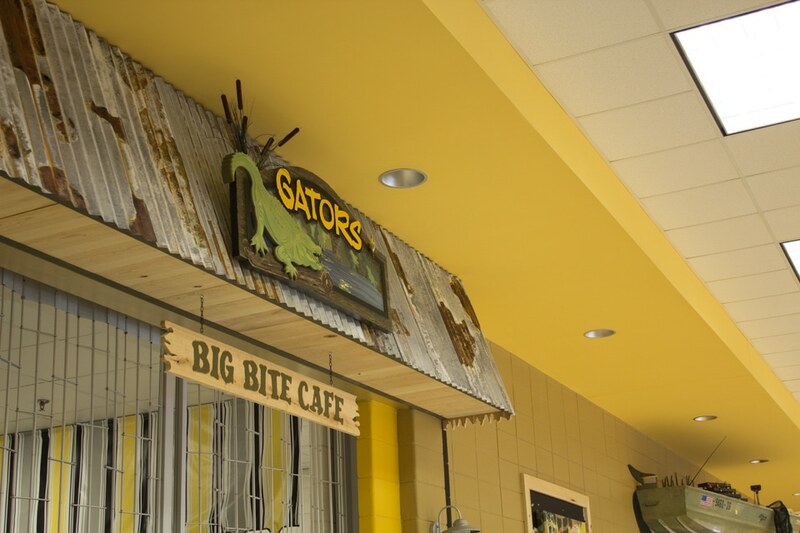 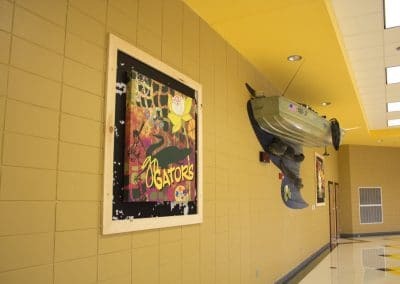 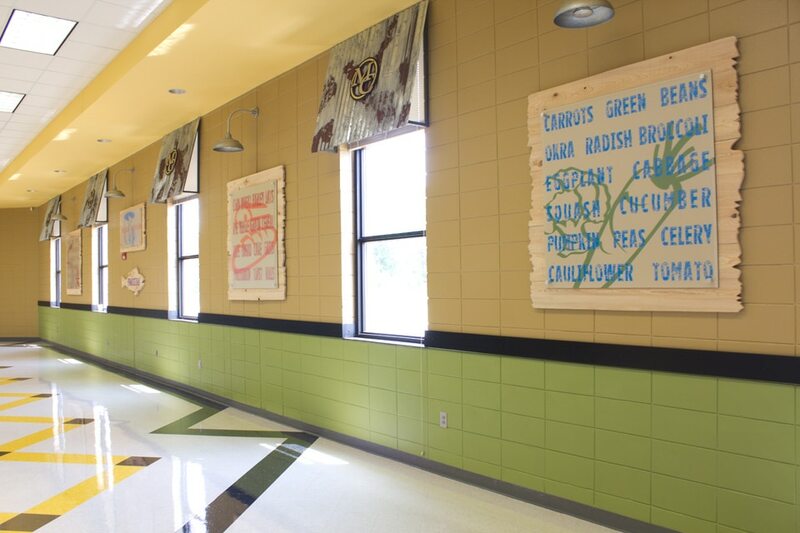 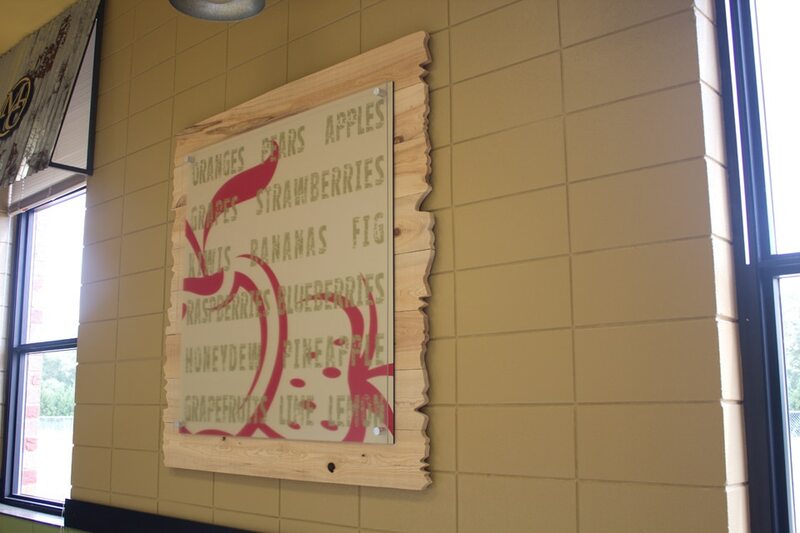 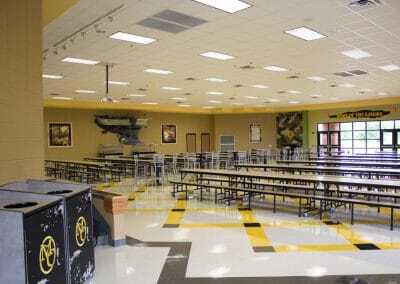 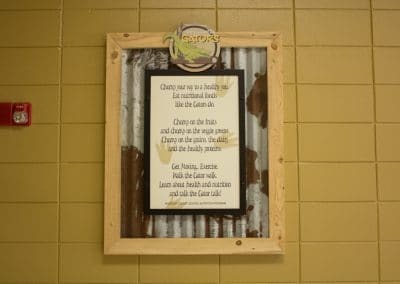 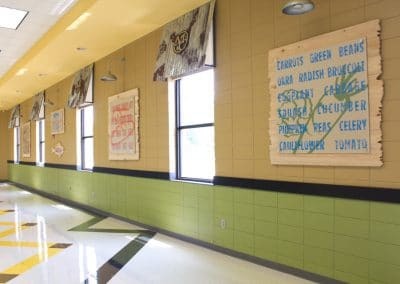 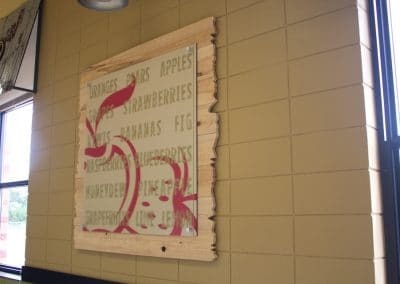 The Gators’ Big Bite Cafe creates the perfect habitat for the growing gator promoting a “take charge of yourself” attitude, stresses the dangers of being unhealthy and is swamped with nutrition education. 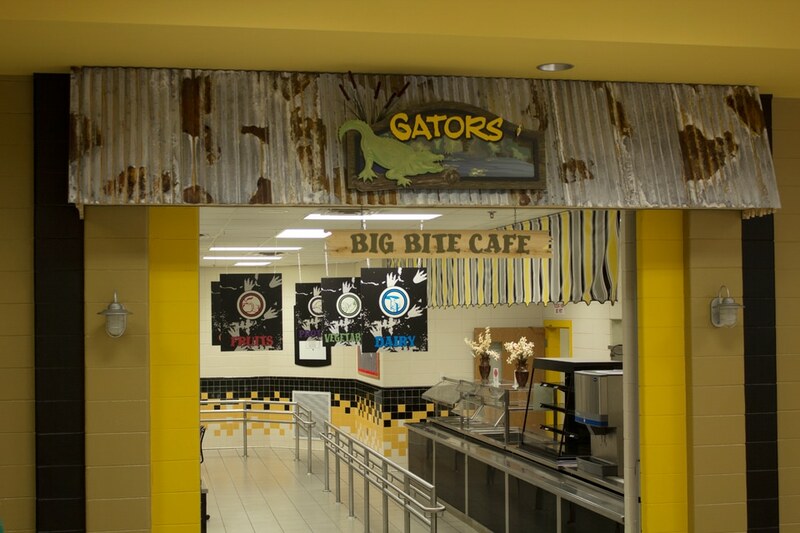 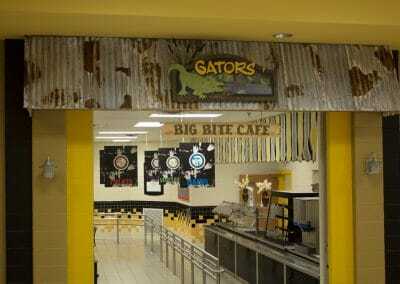 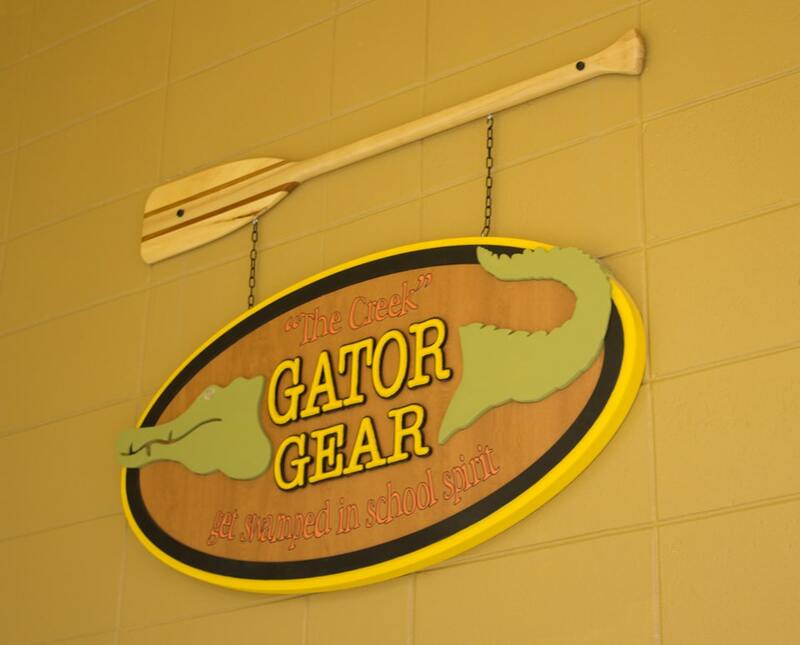 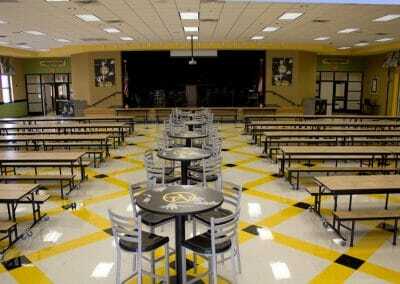 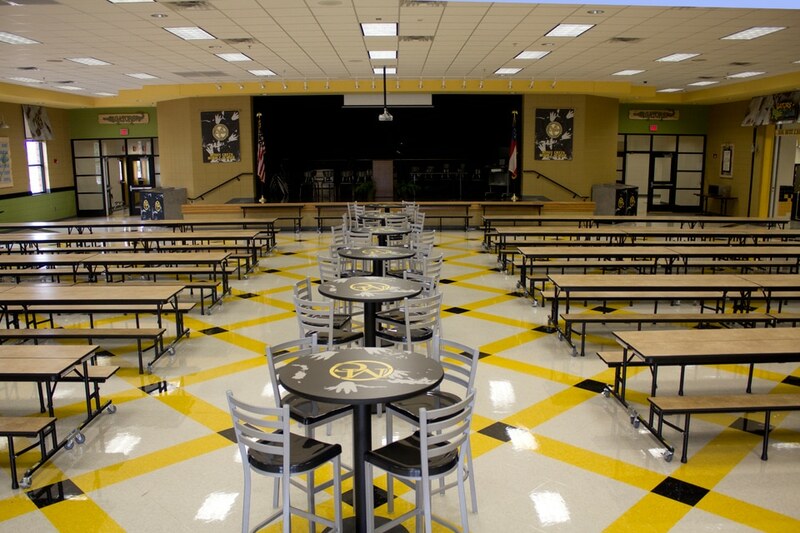 So get your gold and black on and come on back to The Gator’s Big Bite Cafe where you chomp your way to a healthier you and enjoy a balanced meal like the Mossy Creek Gators do.